I'm sure you remember reading about my complete cold weather soup dependency and secret stash of canned soups. And also my promise to tackle my fear of soup making this winter. Well, it's November, it's cold and I've already successfully tackled potato and leek soup and light and creamy pumpkin soup. Soup making, as it turns out, is not a difficult undertaking and I'm happy to say that the stash of cans has gone untouched. Somehow they no longer appeal to me. With the exception of the broth style chicken soup that accompanies matzo balls, I like my soups creamy. Rich, fattening, cream laden...nah. None of the above. Potatoes, low fat milk and my blender have made my homemade versions far healthier than anything found in a can. And I love that I end up with quite a few servings. So this weekend, I asked Brian what kind of soup he'd like and he chose corn chowder. A few of my own personal tweaks and yummy corn chowder it was. Enjoy! Add the olive oil, onion and garlic to a Dutch oven or other large stock pot and cook on medium low for approximately 10 minutes or until the onions are translucent but not browned. Add the potatoes and 1 can of the corn to the pot along with the chicken stock. Bring to a boil, cover and cook for approximately 25 minutes or until the potatoes are fork tender. Working in batches, add about half the soup to a blender or food processor and puree. Be careful not to overfill or the hot liquid will leak out of the blender. Return the pureed soup to the pot and add the remaining can of corn, along with a ladle of soup to the blender. Puree until smooth and return to the pot. Add the cheese to the soup and cook on medium heat for another 15 minutes. Add the herbs and season to taste. Serve hot and garnish with croutons and additional cheese if desired. Makes approximately 8 servings. I'm still so scared of soups. Mmmmmmmm. Also, don't invite me over and use these little ramekins...they may go missing. 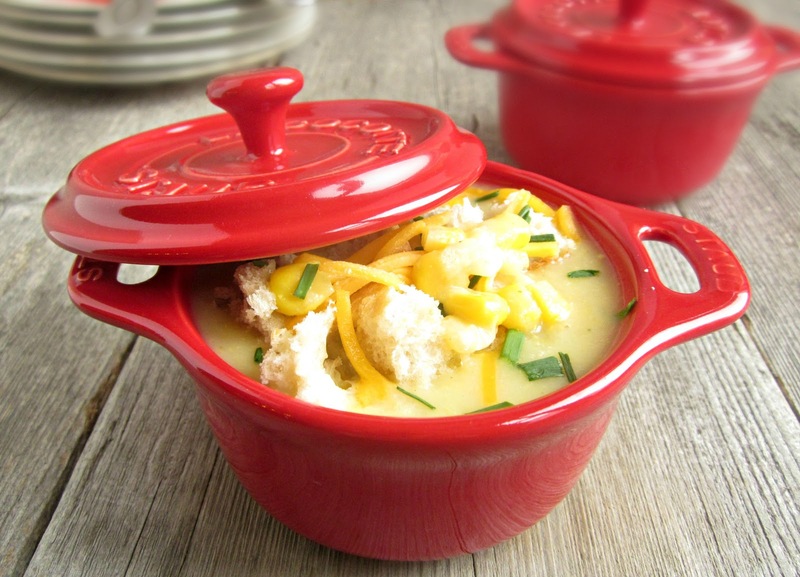 Am a corn chowder fan ... actually became one after eating chicken corn chowder in a Chinese restaurant ... this recipe looks great and I'm definitely going to give it a whirl. Thanks! Looks delicious!! It's getting cooler now so out is on the brain!! I love a good hearty soup. As soon as I clear out a few of the soups and sauces hoarding space in my freezer, I am making a big batch of this to freeze for cold winter nights. Corn Chowder HAS to be one of my favorite things ever. So comforting and hearty! I love corn! This sounds delicious! Putting this on my "to try" list! Cheers! 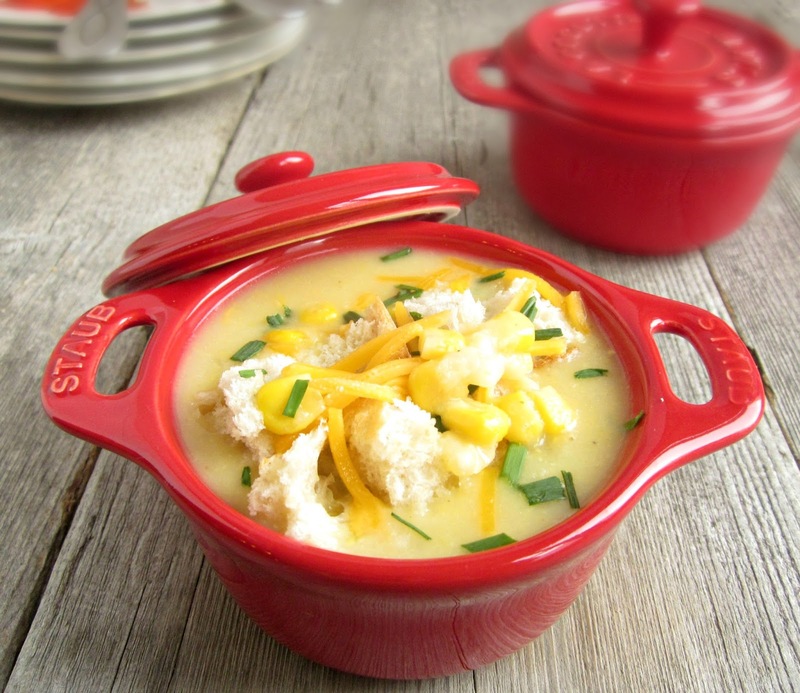 I adore Corn Chowder, just perfect for a cold day to warm you up from the inside out! This looks absolutely yummy and sounds very good for cold weather, which is where we will be next winter so it is something I am going to try.